MISSOULA – The Maidens toughed out a pair of splits to end their week with a season record of 3-3, 3-2 in conference. 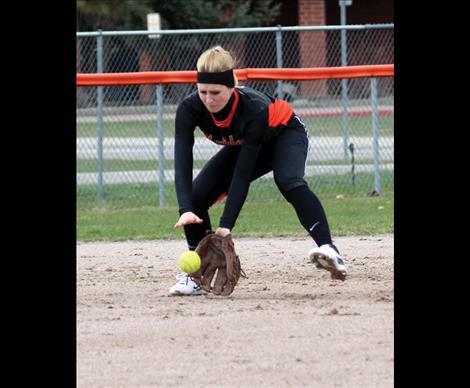 Friday the Maidens challenged Loyola-Sacred Heart in Missoula, posting the first win of the evening only to fall in game two. Starting off on the right foot, the Maidens scored five in the final two innings to pick up the 6-3 win against Loyola. Kendra Starkel led her team at the plate, picking up a pair of RBIs off of as many hits while Gabby Wirz went 2-2 in the contest. Game two brought a little bit more of a battle as the Maidens fell to Loyola 7-8 in the close-but-no-prize game. Returning from a medical leave, Kaitlyn Sassaman proved she was back in the saddle after posting 3-4 for the game. Kenzie Dulmes made her only hit of the game count as she launched one over the fence. Saturday the Maidens hosted Florence at home, ending the day with a split against the tough-hitting Lady Falcons. Game one proved to be a sore spot for the Maidens as they fell 11-16 to Florence. Though the Maidens logged 20 hits and only a single error, it wasn’t enough to overcome Lady Falcon bats. Amanda Morency added a homerun to her 3-5 plate performance while Dulmes was 4-5. After taking a tumble the first game, the Maidens came back to shutout the Lady Falcons 12-0. While scoring in every inning of play, Maiden pitcher Carston Rhine only allowed four hits total, giving her team the opportunity to rack up numbers on the scoreboard. On-fire Morency once again placed the ball on the other side of the fence, picking up an RBI off of her solo homerun while posting 3-4 for the game, 6-9 with two homeruns on the day. Kiana Brown added three runs for her team. The Maidens will travel to Thompson Falls Saturday then return home to host Deer Lodge Tuesday. Courtnee Clairmont 0-3, Jordyn Clairmont 1-4, Kaitlyn Sassaman 1-3, Kenzie Dulmes 1-4, Kendra Starkel 2-4, Amanda Morency 1-4, Carston Rhine 0-2, Kiana Brown 0-3, Gabby Wirz 2-2. 2B – Starkel, Morency. RBIs – Starkel (2), Sassaman, Rhine. Gabby Wirz 0-2, Jordyn Clairmont 0-4, Kaitlyn Sassaman 3-4, Kenzie Dulmes 1-4, Kendra Starkel 0-4, Amanda Morency 2-4, Carston Rhine 2-3, Kiana Brown 0-3, Courtnee Clairmont 0-3. 2B – Dulmes. RBIs – Rhine 3, J. Clairmont, Dulmes, Morency. Kaitlyn Sassaman 2-6, Kenzie Dulmes 4-5, Kendra Starkel 2-5, Amanda Morency 3-5, Carston Rhine 2-5, Jordyn Clairmont 1-5, Kiana Brown 2-5, Gabby Wirz 2-5, Courtnee Clairmont 2-5. 2B – Sassaman, Dulmes, Starkel, Morency, J. Clairmont. HR – Morency. RBIs – Starkel (2), Rhine (2), J. Clairmont (2), Brown (2), Morency, Wirz, C. Clairmont. Kaitlyn Sassaman 2-4, Kenzie Dulmes 1-4, Kendra Starkel 0-4, Amanda Morency 2-3, Carston Rhine 0-4, Jordyn Clairmont 0-4, Kiana Brown 1-4, Gabby Wirz 0-3, Courtnee Clairmont 0-3. HR – Morency. RBIs – Brown (3), Sassaman, Dulmes, Morency.